For the first 48 hours, think R.I.C.E. R = Rest the joint, and keep your weight off of it. C = Compress the joint – wear an elasticized support bandage from the drugstore. E = Elevate it – keep it up above your heart, especially when you sleep. After that, work out what you can. * Hurt your knee? Work your upper body. It’ll help get your circulation going and keep you healthy. Remember to change up your movements. To prevent arthritis, avoid repetitive actions by taking short breaks and switching up your tasks. *Make sure to check with your doctor before starting or changing a workout plan. 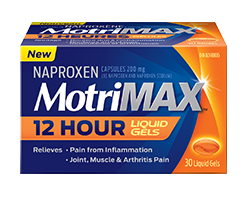 Contains naproxen for up to 12 hours of effective pain relief.